Adam Old was tired of seeing the plastic bags, water bottles and other garbage clogging up his neighborhood’s waterways – not only creating a major eyesore, but also endangering the animals that call it home. So when The Miami Foundation launched the 2018 Public Space Challenge, he applied with a simple, but an impactful idea: to place a trash boom in his local canal to collect all the debris. This would clean up his neighborhood of El Portal and keep trash out of other non-sea walled river banks downstream in Larchmont Gardens and Oakland Grove. It would also keep that trash away from manatee breeding areas. When scaled to other parts of the waterways, additional booms would help collect data and trace this trash back to its source, which, in turn, could lead to a long-term solution. It’s a project that encapsulates the spirit of the Public Space Challenge – a simple intervention with long-lasting and far-reaching effects designed by someone who knows their community intimately. And, it’s an idea that clearly resonates with folks. 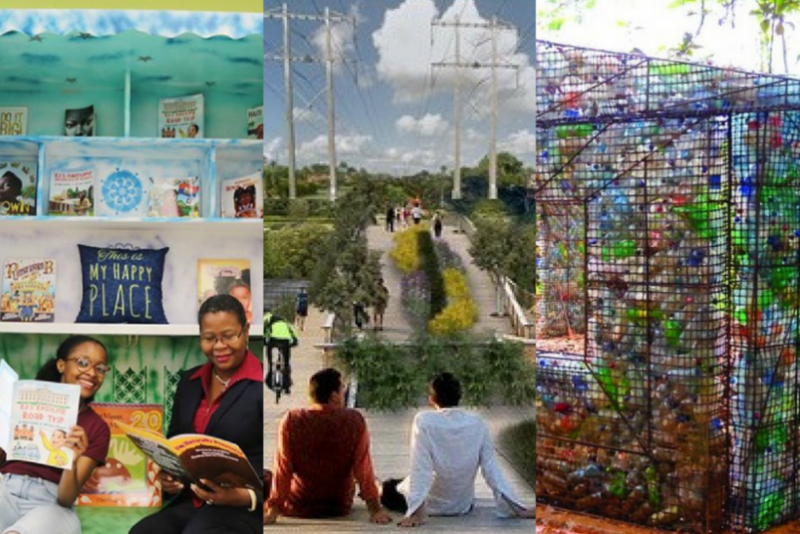 Today, his idea is named one of 56 finalists in the 2018 Challenge through which we’ll award $305,000 to projects that create, improve or activate Greater Miami’s gathering spaces and parks. We asked for your ideas and you delivered like never before, submitting a record number of ideas spanning Miami-Dade, from Liberty City to Homestead, Downtown Miami to West Kendall. You also helped generate buzz for your favorites – ideas garnered 12,000 unique likes and comments, nearly double than years past. The way we take care of our natural surroundings was a common thread among this year’s submissions. We also saw a number of ideas that would create opportunities for neighbors to get together. It’s in reinforcing the bonds between us that we help make this community more resilient. Ideas like Adam’s “Little River Trash Collector” trickled to the top. Two others that stood out would turn trash into art and create public gathering spaces out of it. Gabriela Barrocas suggested taking plastic debris collected from Biscayne National Park to create a touring life-size debris maze. Similarly, Stephanie Jaimes proposed building a musical playground – which she would make out of giant music instruments using recycled materials – at a school in Liberty City and dedicating it to young victims of gun violence. Meanwhile, there were also ideas that would make it easier for neighbors to simply connect with one another and the place they live. In Miami Springs, a crosswalk for residents to safely get to a local park, without having to jaywalk across four lanes of traffic, was the overall Challenge crowd pleaser. The idea received 527 likes, making it the single most liked idea in Challenge history. You can thank Jennifer Gonzalez and Maria Font for that one. Ideas like these and engagement from all of you help make Miami-Dade a better-connected community. It’s one of the reasons why we’ve partnered with the Parks Department to help bring their Open Spaces Master Plan to life – because vibrant and active green spaces are essential to building a stronger, more connected Miami. We also partnered with Target, who will fund projects that encourage healthy lifestyles and active play. This year, you were loud and clear about how you wanted to see Greater Miami build for the future. Your ideas are bringing Miamians together and showing us how we can make Miami a thriving and more connected place to live, one public space at a time. You can see all finalists on the map at PublicSpaceChallenge.org. We will announce the 2018 Public Space Challenge winners in October.